Take a 9x5x3 pan, and grease and flour the pan, or line with parchment paper. Preheat the oven to 350 degrees. In the bowl of a mixer combine shortening and sugar. Beat them together until creamed and fluffy. Add eggs and beat mixture for three minutes. In a separate bowl, combine flours, starches, baking powder and soda, and salt. Sift or blend well. Mash the bananas until they are smooth. They should be a bit overripe to have the best flavor. Add molasses (I use blackstrap). Blend into bananas until well mixed. Add flour mixture and banana mixture alternately to shortening mixture. Blend well after each addition. When all combined, and evenly blended, fold in Walnuts. Put into loaf pan. Bake for 60-70 minutes or until a toothpick inserted in the center comes out clean. Allow to cool in the loaf pan for about 15 minutes, then remove from pan and cool completely on a rack before slicing. The flavor will improve if banana bread is left overnight before slicing. This will give approximately similar results to the original that uses tapioca starch. Add an extra Tablespoon of baking powder to the flour mix. 2 teaspoons Knox unflavored gelatin, softened with 2 Tablespoons cold water, and 4 Tablespoons boiling water to dissolve. When gelatin is dissolved, put it in the refrigerator for 15 minutes to thicken, then add to the mixer bowl and whip for about 2 minutes after creaming the shortening and the sugar. Then add 2 Tablespoons oil to the mixture with the molasses. I have altered this recipe a little to make it more moist. It will be almost as thick as cookie dough. Turn off the preheated oven and let it rise for 15 minutes before baking, then turn the oven back on for 60 minutes or until a toothpick inserted in the center comes out clean and top is slightly springy. 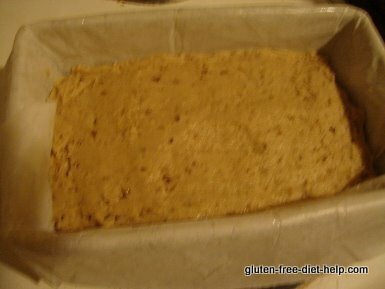 I hope you will enjoy my gluten free banana bread recipe! You might want to try it with pecans instead of walnuts too. 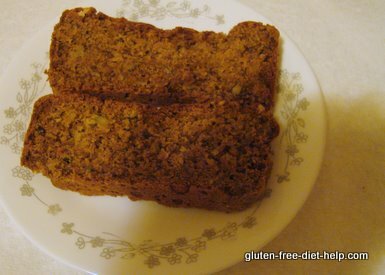 You can use this gluten free banana bread recipe to make banana nut muffins too, just use paper liners, fill them about 2/3 full and bake about 20-25 minutes.